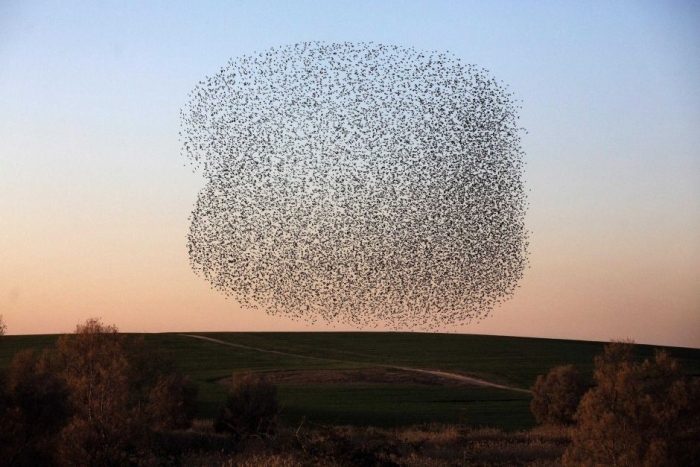 A formation of birds have created a mesmerising dance across Israeli skies. Breathtaking “murmurations” — dark, shifting shapes that look like vast dancing clouds — fill the skies of southern Israel and surrounding areas every winter. 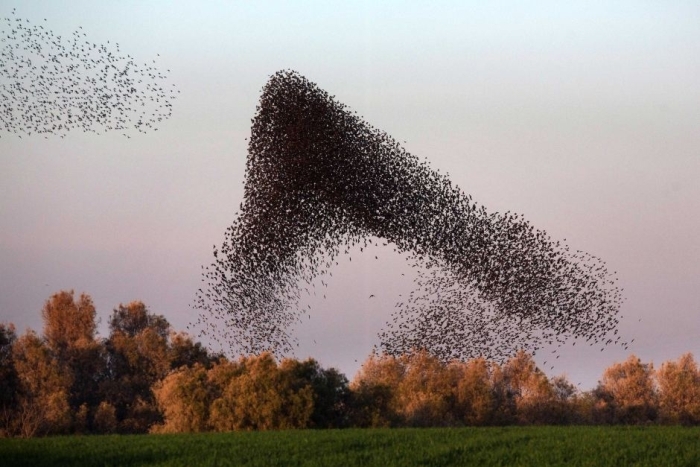 Starlings from Russia and east Europe swoop, pivot and soar to put on a display in the Holy Land. Their latest flight was captured on video. Tel Aviv University ornithologist Yossi Leshem said the birds embarked on the evening acrobatics both to help each other find food and to fend off predators. 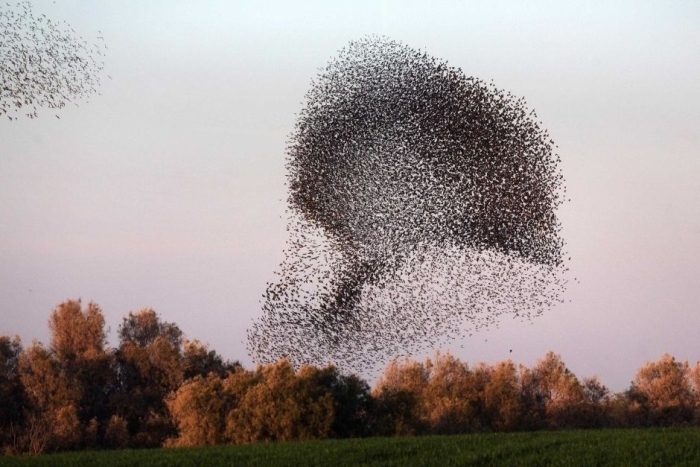 Mr Leshem said a falcon or hawk would often try and focus on a single bird, but by grouping together, the starlings not only found safety in numbers, but their changing movements and shifting collective shape confused would-be attackers. Mr Leshem said the birds could even create a sudden breeze with their synchronized movements, causing a hawk or falcon to fall flat on its back, not unlike an aircraft hitting windshear. In the Mystery School, Jalarm gave an account of group minds referencing the entire animal kingdom – “the school of fish”, the group mind of a flock of birds here. 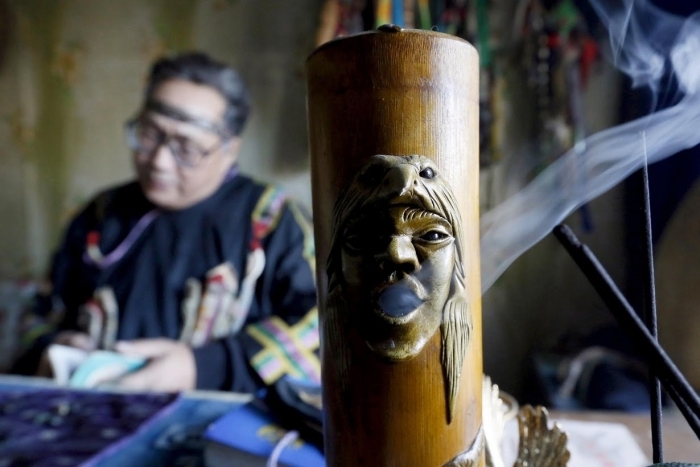 In the Tuva region of southern Siberia, an area inhabited by historically cattle-herding nomads, people consult local shamans to find out more about their destiny or address medical and other problems. Practices include the Kamlanie night ritual, conducted by shamans representing the so-called Adyg Eeren (Bear Spirit) society. Tuvans nowadays follow two main religious practices – Buddhism and Shamanism. Vyacheslav Arapchor, a shaman representing the so-called Dungur society, conducts a session to clarify and predict the destiny of a customer. 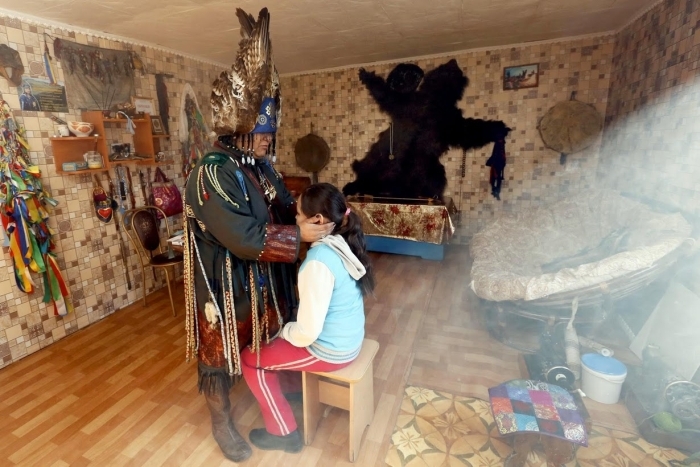 A female shaman Saida Mongush conducts a medical session to cure Norzhunmaa, a 9-year-old girl suffering from curvature of the spine. Note the light energy coming into the room. According to the Bible, an angel appeared to Moses in the Burning Bush on Mount Sinai, then the voice of God revealed the Ten Commandments. 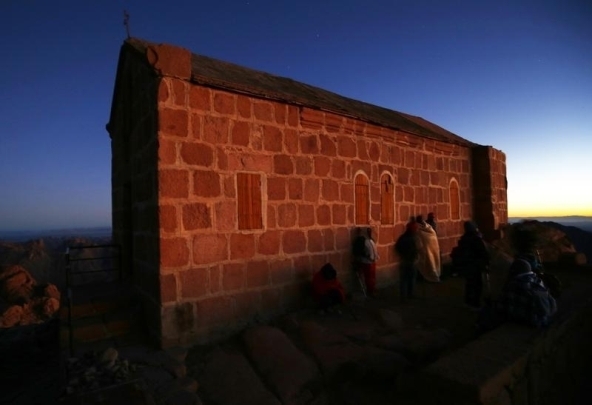 Saint Catherine’s Monastery, which dates back more than 17 centuries and is now a UNESCO World Heritage site, describes itself as being located at the very same spot. 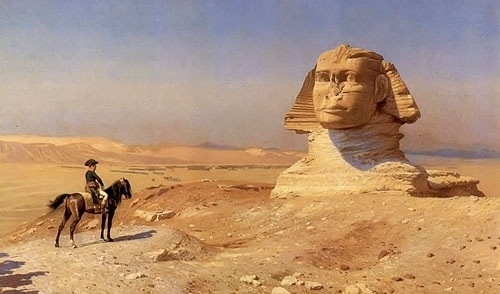 In the Mystery School, Jalarm has shared some interesting history about Moses – he was a Royal Pharoah of Egypt. You can read what Jalarm shares about Moses here. You can read watch a slideshow of scenes on a pilgrimage to Moses Mountain – Mt Sinai. here. You can read an eyewitness account and view more photographs here. What are those colorful rings around the Sun? A corona visible only to Earth observers in the right place at the right time. 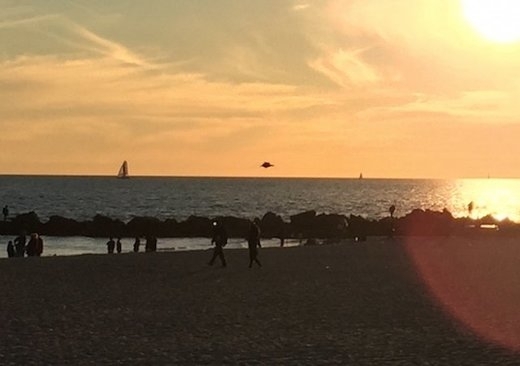 Rings like this will sometimes appear when the Sun or Moon is seen through thin clouds. The effect is created by the quantum mechanical diffraction of light around individual, similarly-sized water droplets in an intervening but mostly-transparent cloud. Since light of different colors has different wavelengths, each color diffracts differently. 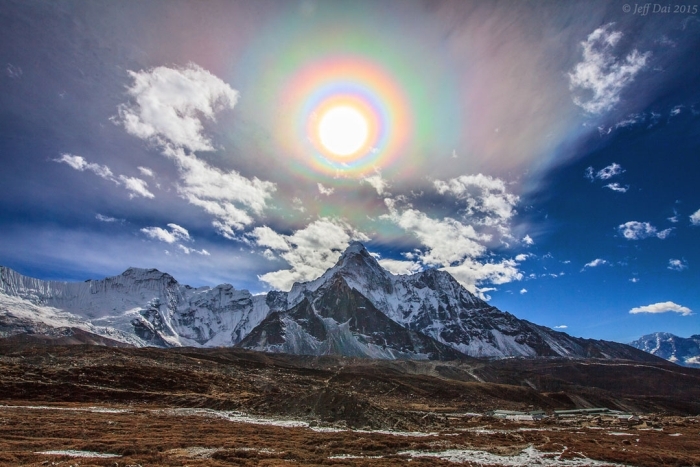 Solar Coronae are one of the few quantum color effects that can be easily seen with the unaided eye. This type of solar corona is a visual effect due to water in Earth’s atmosphere and is altogether different from the solar corona that exists continually around the Sun — and stands out during a total solar eclipse. In the foreground is the famous Himalayan mountain peak Ama Dablam (Mother’s Necklace). You can read more and see a full sized image of this solar corona here. There have been rumours of passageways and secret chambers surrounding the Sphinx and during recent restoration work several small tunnels have been re-discovered. One, near the rear of the statue extends down into it for about nine yards. Another, behind the head, is a short dead-end shaft. The third, located mid-way between the tail and the paws, was opened during restoration work in the 1920’s, then resealed. It is unknown whether these tunnels were constructed by the original Egyptian designers, by visiting aliens or were cut into the statue at a later date. There are clear signs of ancient machining technology in some of the pyramids and other structures, capabilities far beyond the bronze tools of the pharaohs. And the sheer size of some of the stones, and the great distances that they were moved from quarries hundreds of miles from their present locations would be a challenge even in the 21st century. Gravitational waves are ripples in spacetime created by any particle or object with mass. Gravitational waves were predicted by Albert Einstein in 1916 on the basis of his theory of general relativity. Sources of detectable gravitational waves could possibly include binary star systems composed of white dwarfs, neutron stars, or black holes. 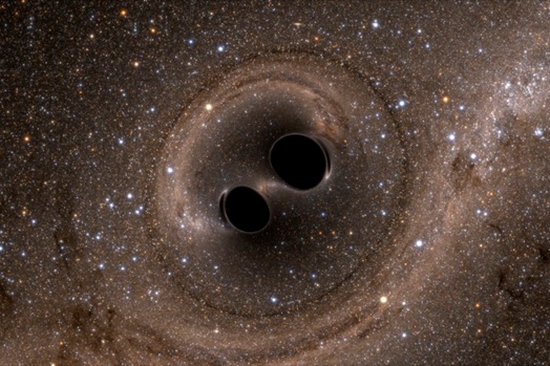 On February 11, 2016, the Advanced LIGO team announced that they had directly detected gravitational waves from a pair of black holes merging. Here is the video explaining this event. 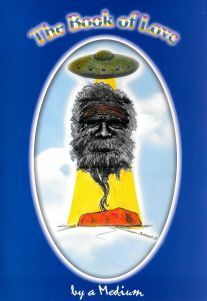 One might ask what the significance of this is for spiritual seekers and those who are participating in Ascension, the expansion of human consciousness. 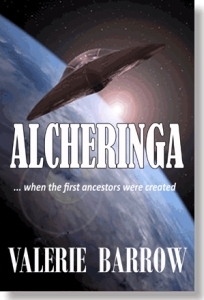 In the Mystery School, Jalarm has shared that everything in the universe has a signature, a type of energy. That signature is eternal for energy never passes away. That the gravitational waves have been detected now (and not earlier) suggests the opening of the stargates (something Jalarm has referred to often) and the raising of energy – and consciousness of all life forms – on Planet Earth, including Planet Earth herself. 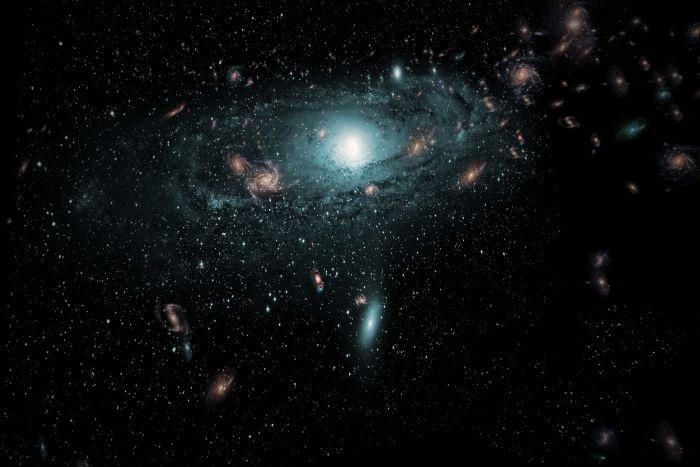 “The Great Attractor contains a large number of galaxy clusters and superclusters and our whole Milky Way is moving towards them at more than 2 million kilometres per hour,” said the study’s lead author Professor Lister Staveley-Smith, of the International Centre for Radio Astronomy Research at the University of Western Australia. White Buffalo Woman predicted there would be times of change and transformation for the Wolakota peoples, and for all on Earth. One of those signs, she said, would be that creatures of the wild that are normally of many different colours would start to be born without their natural colouring. The young would be pure white. They would not be albinos but a naturally white species for their eyes would be normally-coloured. It would start with the buffalo of the American plains, normally dark brown and almost black. White buffalo calves would start appearing all over the plains. After a while, other animals, birds and reptiles, never normally white, would start to make their appearance in many different parts of the world. 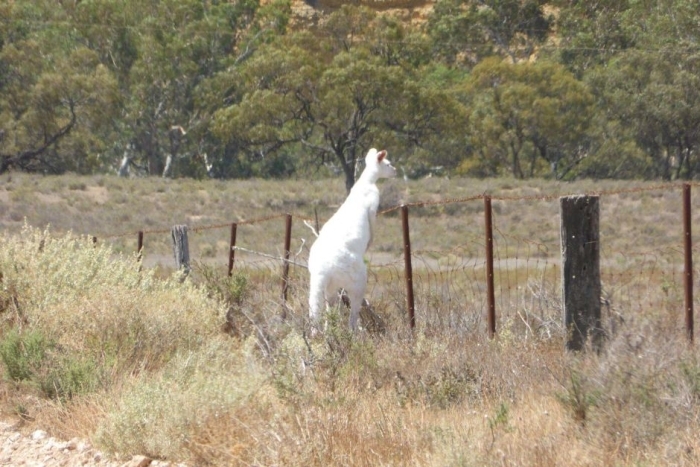 A rare albino kangaroo has become a social media star after being spotted at the Big Bend on the River Murray in South Australia. Albino animals usually have a shorter life-span as their easy-to-spot appearance makes them vulnerable. Their white skin also makes them susceptible to sun damage and skin cancer, and they have a genetic predisposition towards sight and hearing issues — making it harder for them to fight off prey. Remains of a Neanderthal woman who lived around 100,000 years ago in the Altai Mountains of Siberia reveal that human and Neanderthals mated much earlier than previously thought. One or more of her relatives were actually humans, a new study shows. 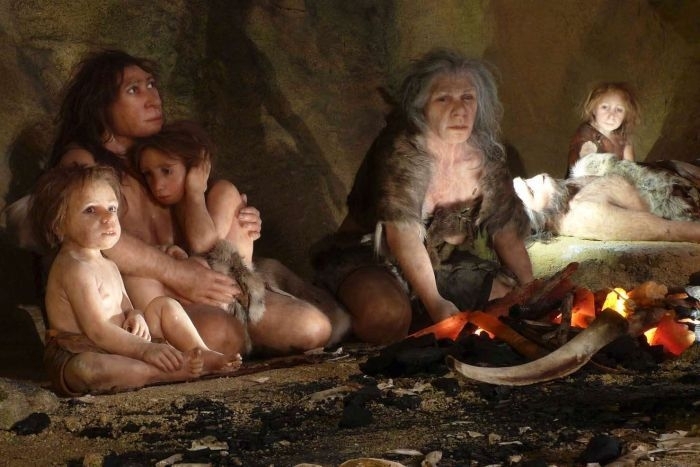 It has been known that Neanderthals contributed DNA to modern humans, so people today of European and Asian descent retain Neanderthal DNA in their genomes, but the Neanderthal woman offers the first evidence that gene flow from interbreeding went from modern humans into Neanderthals as well. The study, published in the journal Nature, “is also the first to provide genetic evidence of modern humans outside Africa as early as 100,000 years ago,” said the study’s co-author Dr Sergi Castellano, of the Max Planck Institute for Evolutionary Anthropology. Diminutive humans who died out on an Indonesian island some 15,000 years ago were not Homo sapiens but a different species, according to a study that dives into a fierce anthropological debate. Fossils of Homo floresiensis, dubbed “the hobbits” due to their tiny stature, were discovered on the island of Flores in 2003. Controversy has raged ever since as to whether they were an unknown branch of early humans or specimens of modern man deformed by disease. 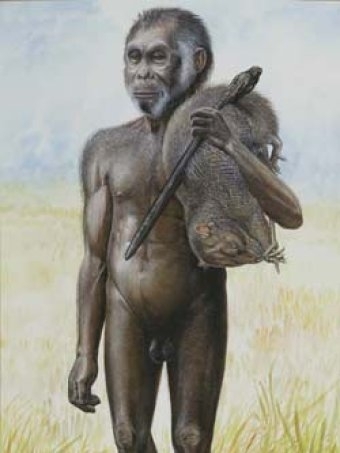 The study, based on an analysis of the skull bones, shows once and for all that the pint-sized people were not Homo sapiens, according to the researchers. 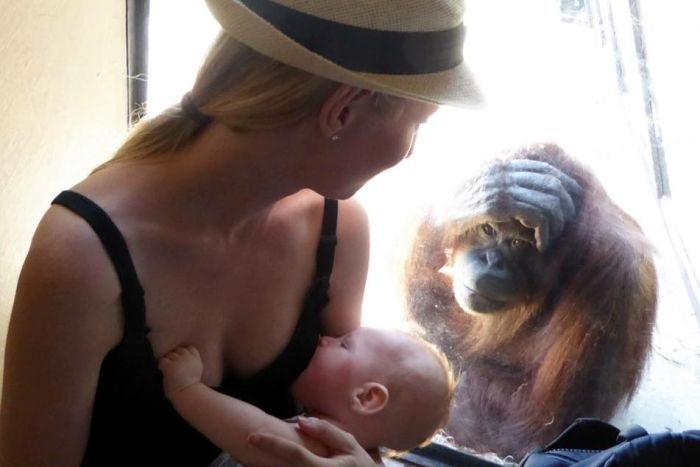 A breastfeeding mother has had an emotional encounter with two orangutans at Melbourne Zoo. Elizabeth was at the zoo on Sunday with her family, celebrating her three-year-old daughter’s birthday. Her 13-week-old son Eli was hungry so she walked around the corner to breastfeed him in private. That is when two orangutans came over to watch. “I went around the corner to be a bit private and I was breastfeeding and this orangutan locked eyes with me and came over to check out what was going on,” she told 774 ABC Melbourne. 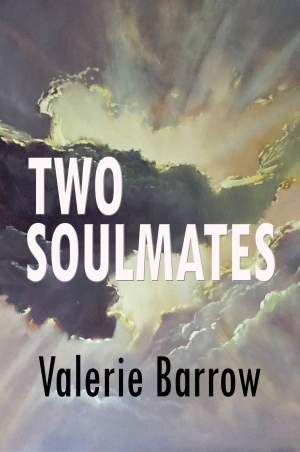 “It started off with just one, then another one came over who seemed to be a bit older and shooed this one off for a little while. “And she [the older orangutang] came over and gave me a bit of a nod.” I felt so proud and I felt she was proud of me and … I don’t know. It was just amazing.